PROVIDING YOU WITH acf bonding EQUIPMENT, RENTALS, THERMODES, AND SUPPORT FOR YOUR acf bonding PROJECT. AIT provides machines, hot-bars, custom tooling, and process engineering services to companies needing assistance with their ACF hot-bar bonding process. 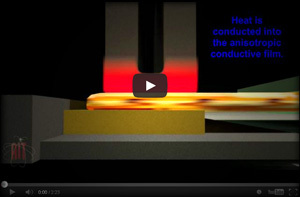 Bonding with a hot bar (thermode) is an ideal way of making anisotropic conductive film attachment. The best way to begin is by sending us pictures or samples of your products that you wish to have bonded. Then we can make a recommendation of what equipment would be best, and provide price and availability on the equipment you need. 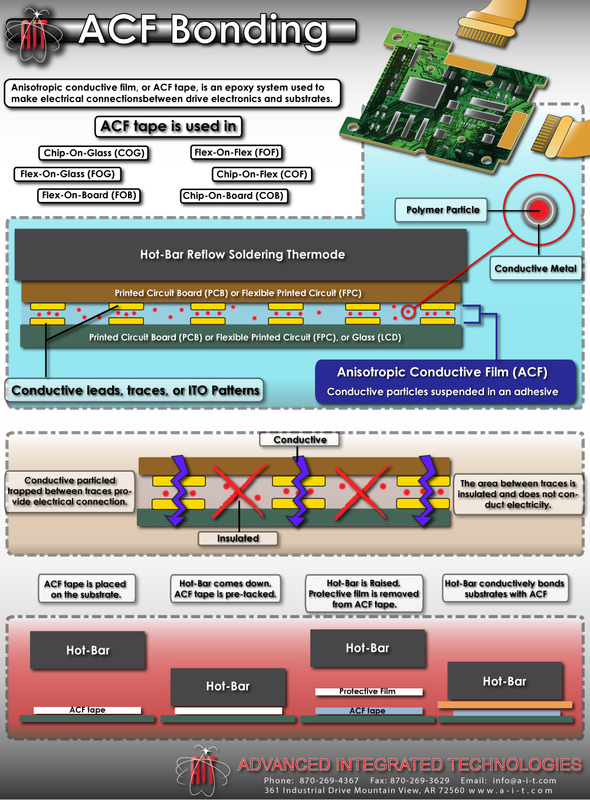 (Anisotropic conductive film) or ACF tape is an epoxy system used to make electrical connections between drive electronics and substrates such as chip-on-glass (COG), flex-on-glass (FOG), flex-on-board (FOB), flex-on-flex (FOF), chip-on-flex (COF), chip-on-board (COB), and similar applications. 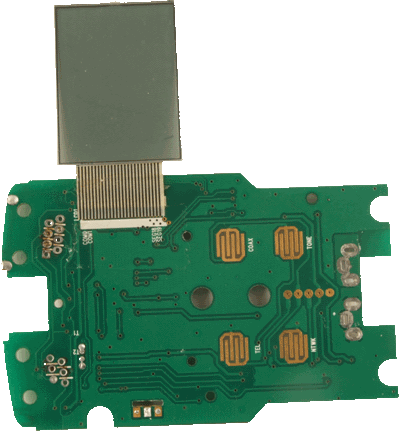 ACF tape is sometimes called Zebra Tape in the LCD industry. ACF tape has little conductive particles in the conductive lines of the tape. During the ACF bonding process, heat and pressure are applied via a thermode ( or hot bar) on to the ACF film or other component that is sandwiching the ACF film. The conductive particles are compressed between the traces or conductive bumps on the components being joined. The spheres are pressed into the bonding footprints and thus provide electrical contact. As the heat is removed, the conductive particles are trapped into permanent compressed form. The particles are distributed with a minimum chance of electrical shorting in the x-axis and y-axis, other than under the points of compression. ACF has been used in glass display applications for many years. It has recently become widely used in COF and COB areas. Industries that use this technology most are the mobile phone manufacturing, automotive industry, and LCD production / mobile computers. The source for heat and pressure in ACF bonding is most often a hot bar, or thermode. Hot bar bonding systems are designed to heat the hot bar to a specific temperature using low voltage electricity, which temperature is fed back to the controller via a thermocouple. Tooling is designed to hold the components and position the ACF tape to line up correctly with the conductive pads on the PCB or other component. The hot bar is then brought into contact with the ACF film over the top of the bonding pad, heated to the bonding temperature, and held for a specified time. This process is what produces the connection between the ACF tape and the components. Advanced Integrated Technologies is equipped to assist you with your ACF bonding process. Call us today to put our experience to work for you. To share this AFC Bonding Infographic, please copy and paste the code below into your website or blog.